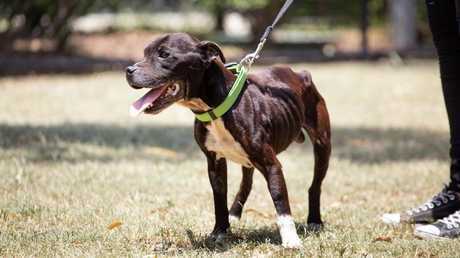 RSPCA is investigating after an abandoned dog was found so severely underweight "it looked like his head was caved in". The 10-year-old Staffordshire cross named Stig was found sheltering under a tree in 31-degree heat about 2pm on Wednesday in Wayland Circuit, Morayfield by resident Madi McCarthur. "I went to see if he was all right and straight away I noticed the hip bones," she said. "I grabbed some water and my neighbour helped me carry him into the backyard because he didn't want to walk. He was quite lethargic." 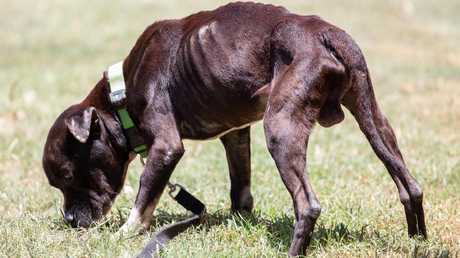 Stig the 10-year-old English Staffordshire was found abandoned and severely underweight in Morayfield. Ms McCarthur said she took the pooch to a vet while she waited for an RSPCA inspector to arrive - that's when she noticed just how bad his physical state was. "The vet took one look and said 'that's the worst condition I've seen a dog in'," she said. "Above his eyes he had two dints either side. "I asked why his head looks like that and the vet said 'that's where muscle is supposed to be'. "The muscle deterioration in the head was so bad it looked like his head was caved in. "His body was basically eating itself." Stig was picked up by an RSPCA ambulance and is now recovering at its Wacol facility before being fostered out. Spokesman Michael Beatty said it was possible he had a parasite. "The dog's doing okay," he said. Stig is recovering in care of RSPCA but has a long way to go. 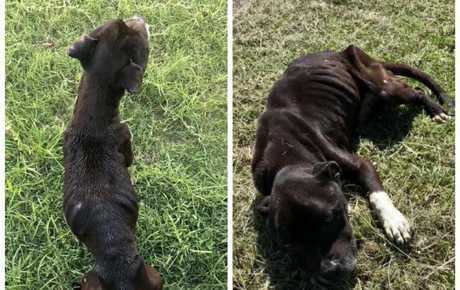 "It's been put on a feeding plan then it will go into foster care while it builds up weight, but it's not likely to be up for adoption anytime soon." This comes a week after Caboolture was named Queensland's worst suburb for animal cruelty complaints to the RSPCA. Morayfield was the second worst for at least four consecutive years. RSPCA is investigating. The staffordshire cross was found near Bunnings at Morayfield.